When the world outside overwhelms, revitalize in a shimmering pool or unwind in your peace-filled garden sanctuary. Located in the scenic south of Hua Hin, Sivana Gardens is set at the foothills of Khao Tao mountain facing the sea in an area of enviable peace. Sivana Gardens Villas are known for their deep tranquility and is designed to combine affordable comfort with an appreciation for the environment. These quality homes are built to fit every possible requirement combining the best of utility and aesthetics. Sivana Gardens offers exclusivity with top security. 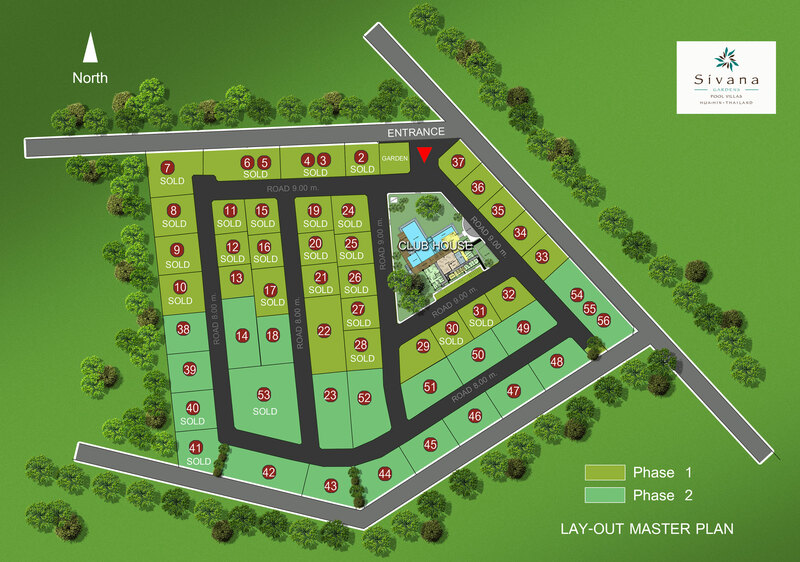 Sivana Gardens has 2 phases. Phase I with 30 quality homes and Phase II with 20, which will be centered around a Clubhouse with fully facilities (see below). Our show house is already complete for your viewing pleasure. Hua Hin, with its unique sandy beaches and natural beauty, offers a multitude of lifestyle opportunities and was voted a “golfer’s paradise” in 2009, proudly hosting 9 gold medal golf courses. The King’s city, as it is widely known, is a world renowned destination with a combination of award winning spas, boutique hotels and international restaurants. Gaining a reputable name for itself, Hua Hin rose to popularity after it became the location of the Summer Palace for the Thai Royal Family. Today it is frequently visited by many affluent Thai families along with foreigners. Sivana Gardens is more than a lifestyle or second home, this prime location is a worthy investment in the ease of living and financial security. Sivana, meaning ‘an oasis of enlightenment’ in Sanskrit, perfectly describes the setting of this enclave. Investing here is an opportunity to invest in peace of mind. The 7 tropical pool villas of Sivana Gardens are unique, cool and comfortable. Each villa features a rooftop terrace, making it the perfect entertainment area with clear views of the surrounding hills.